This industrial simulation and training conveyor belt model is arranged in a U-shape, for intermittent transport and for the machining of several workpieces. Model is mounted on a stable wooden board and packed in wooden crate. 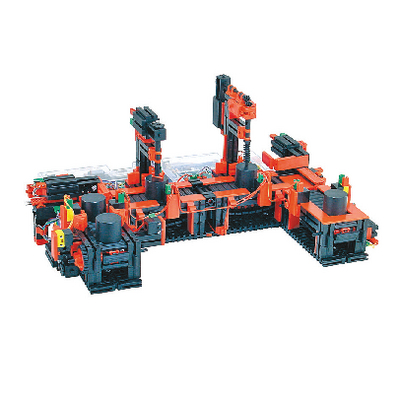 Includes two machining stations, four conveyor belts, eight DC motors, four limit switches, and five light barriers consisting of phototransistor and lens tip bulb. Ordering information: Includes nine digital inputs and ten 9V outputs. Indexed lines require Fischertechnik Energy Set, available separately.